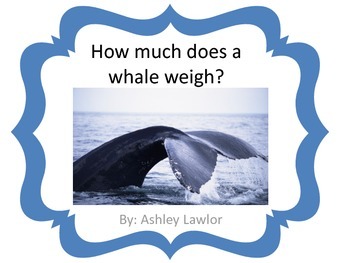 How Much Does A Whale Weigh? 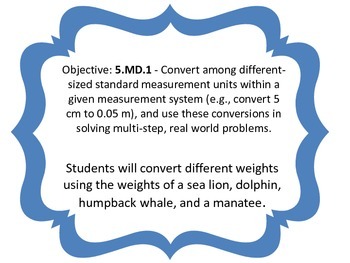 In this activity the students are converting between customary units of measure. They are using the weights of a whale,dolphin, manatee, sea lion, and sea turtle. 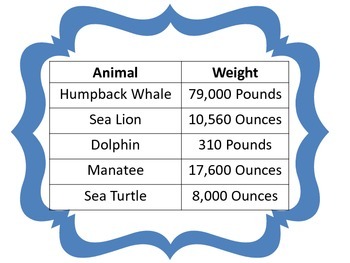 Students will convert weights from pounds to ounces and organize these animals from least to greatest according to weight. They will then complete the same activity and convert the animals weights into pounds.